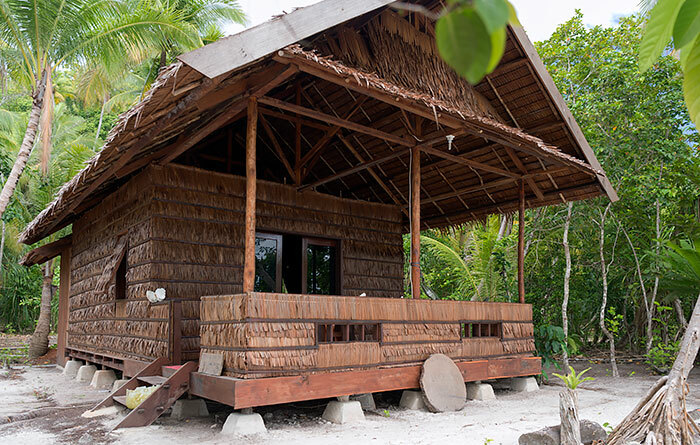 Lukson Homestay occupies a stretch of sandy beach at the eastern end of the popular island of Kri and has three private bungalows. 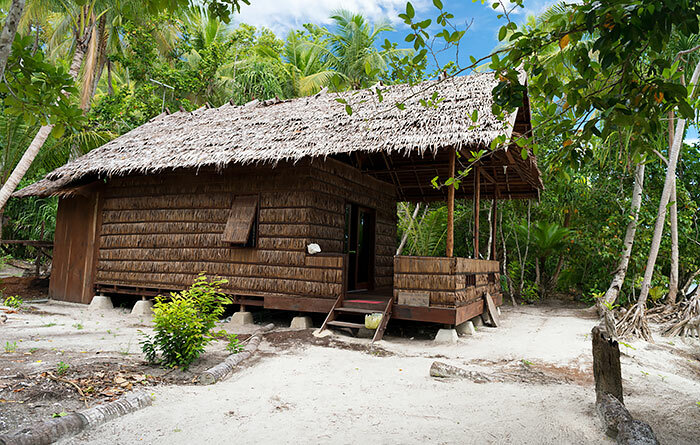 Two VIP bungalows with ensuite bathrooms, large living areas and verandahs are situated on the beach. 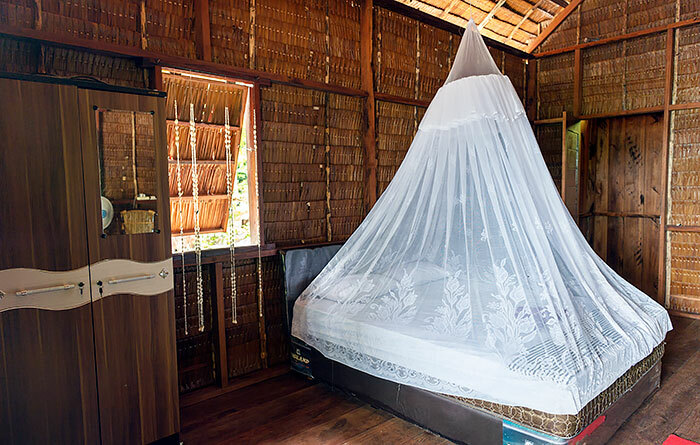 The VIP bungalows are equipped with the usual bedding and mosquito nets, and also have hammocks, mirrors, tables and chairs. 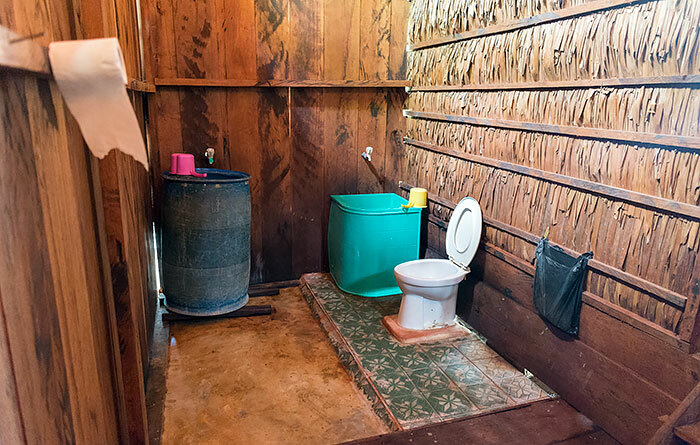 The ensuite bathrooms have bucket bathing, western style toilets and running water. Both bungalows have room light switches and power outlets for charging devices. Nearby in the shade of beachside trees is Lukson Homestay’s huge VVIP bungalow. The VVIP bungalow has a real mattress and base bed and is also equipped with a lockable wardrobe with mirror, a fan and comfortable cane chairs and table. The large verandah at the front of the VVIP bungalow also has chairs and a table and provides ocean views framed by beachside trees. In addition to the usual generator-supplied electricity and power outlets, the VVIP bungalow also has its own solar power supply with a 500VA inverter and two international power outlets that will supply electricity when the homestay generator isn’t operating. 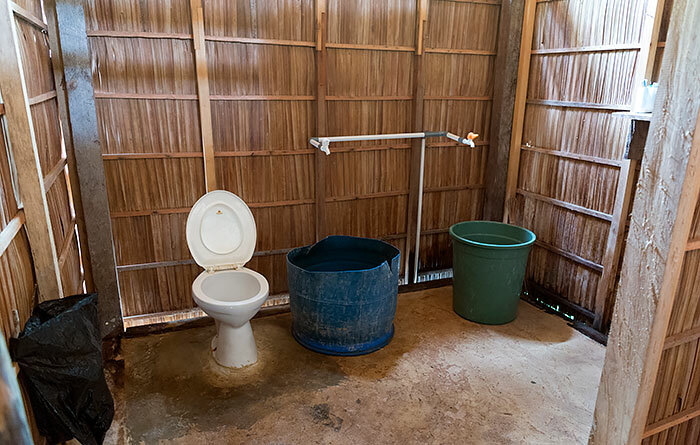 The VVIP bungalow’s spacious ensuite bathroom has running water, bucket bathing and a western style toilet. 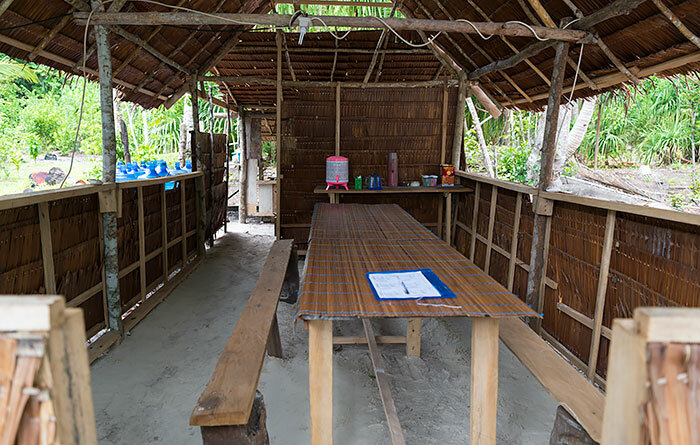 Meals at Lukson Homestay are currently served in a sand-floored dining shelter on land, but a new over-water dining room will be available later in 2017. You’ll find the usual large table, bench seating and free drinking water and tea and coffee making supplies there. 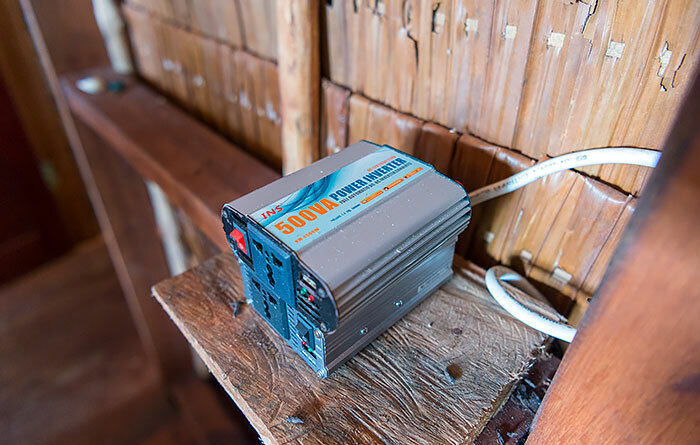 Electricity at Lukson Homestay is provided by generator and is available from sunset until around midnight. A reasonably strong phone signal is available, but a data connection was unavailable when we visited in June 2017. English is spoken at Lukson Homestay. Safe rubbish disposal is unavailable on any of the Raja Ampat islands, so if you want to avoid contributing to the trashing of paradise, please take all the inorganic waste you create away with you when you leave. 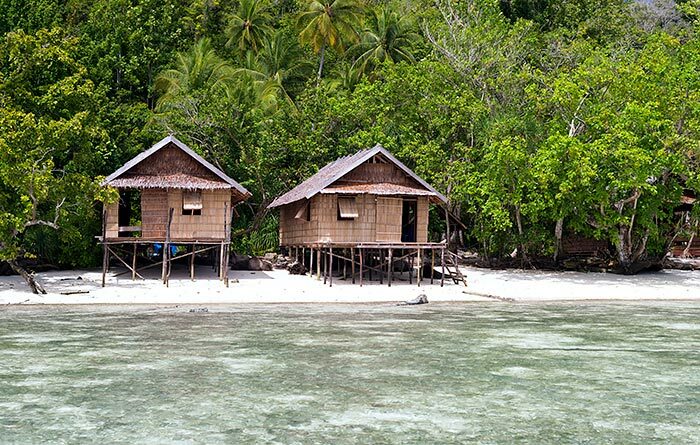 Transfers between Lukson Homestay and Waisai cost IDR 500,000 each way, with the cost shared by boat passengers. The boat used can carry a maximum of 8 people. Diving is available at Lukson Homestay and costs IDR 550,000 per person per dive (including equipment). 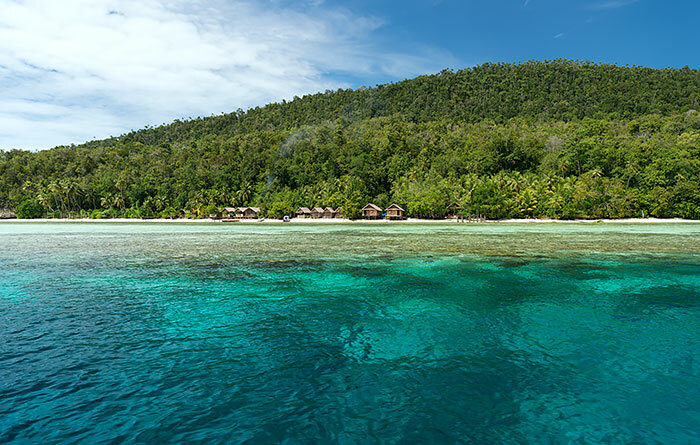 Dives can be organised at any of the famous Dampier Strait, Piaynemo and Kabui Bay sites. Contact Luki for more information. 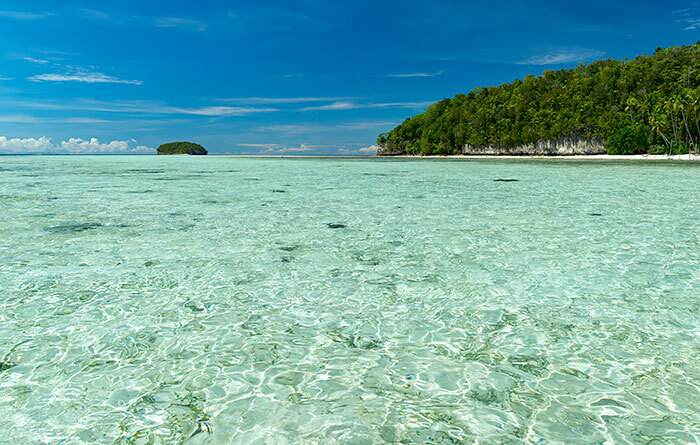 Fabulous free snorkelling (bring your own gear) is available from the beach at Lukson Homestay and snorkelling trips can be organised as desired. Village visits, trips to Gam or Waigeo to see Birds of Paradise and other sightseeing trips can be arranged on request. Long coastal hikes are also possible at low tide, when you can cross the sandbanks from the western end of Kri to Mansuar. There are also trails to the forested heights of kri for panoramic Dampier Strait views. 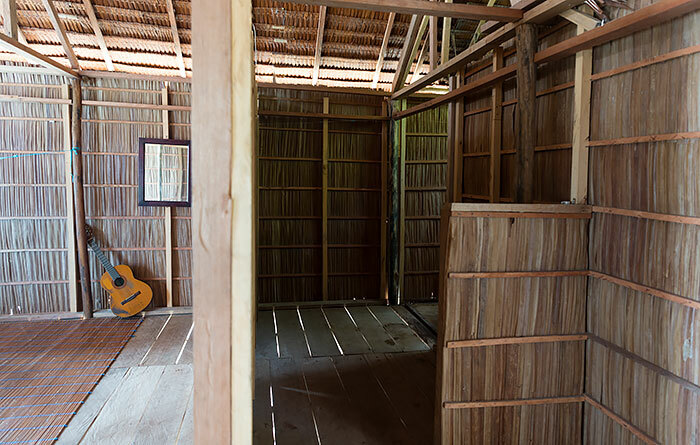 Lukson homestay: A true paradise, simplicity, breathtaking beauty of almost untouched nature. Behind the bungalow: the lush vegetation, the chirping jungle. Directly in front of us, far over the sea, the silhouettes of Gam and Waigeo. 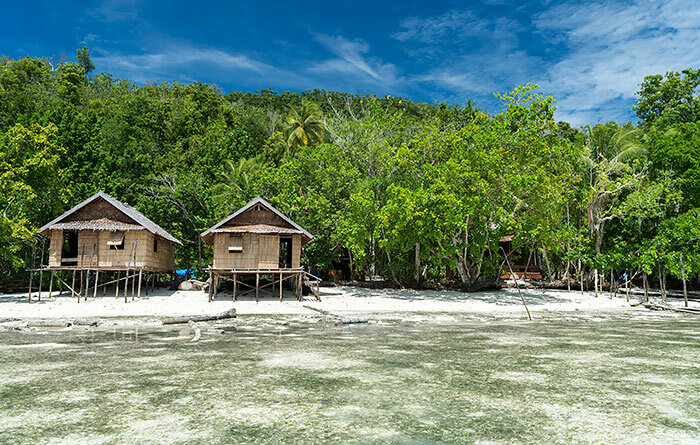 Less than 100 meters off the coast, the island base falls deep into the sea and parallel to the coast opens the unique underwater world of Raja Ampat. Everything we have seen in Ceylon, Thailand, Bali, Lombok, Egypt, Maldives during 24 years is here to meet in macro format, and much more overwhelming are the number and size of the swarms: napoleon, tuna, barracudas, reef sharks were patroling so fascinating and authoritarian along the corals, sea turtles. Small rays have swum to our feet. In the vicinity of Lukson is the diving spot Cape Kri, only a few minutes with his small boat are Cape Mansuar, or Yenbuba jetty, we knew from National Geographic or Geo. the brother of Luki, Alvin is one of the more experienced dive guides of R.A, also very friendly, helpful and speaks English. For boat trips, snorkeling, Luki is always responsive, such as to Friwen, Sawandarek on Mansuar, depending on the weather and waves, he would have to rent larger boats, but our final price was always fair. To the Lukson family: Luki and Ivon, a young energetic family with a sweet 1.5 year old son Andre, with a playful dog Roomy, two cats, Espaniol and Manta. 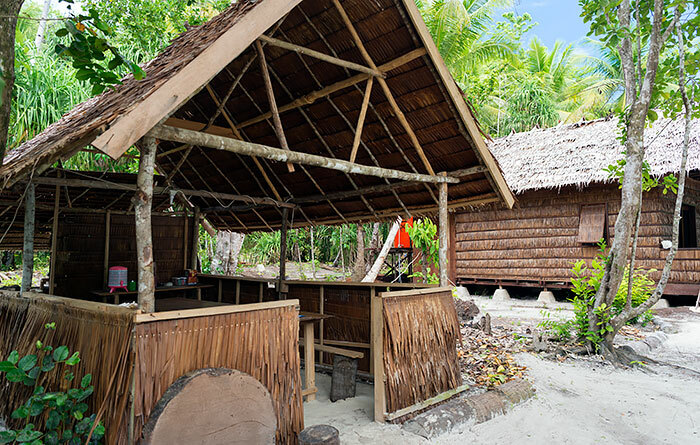 His bungalows, traditional Papuan houses, covered with grass, bamboo leaves, cool and windpermeable by heat. 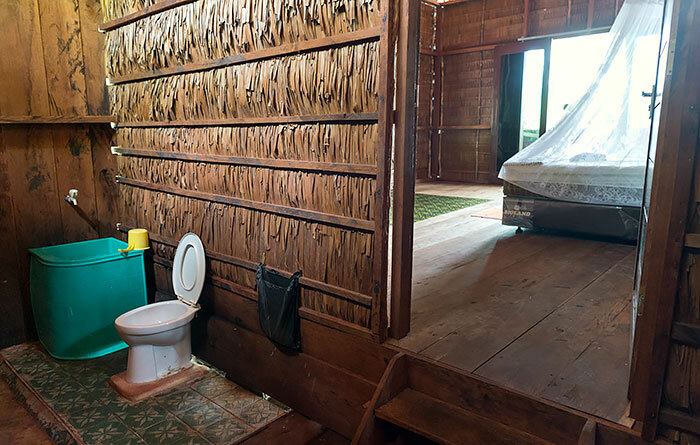 Each bungalow has its own simple bathroom with toilet, the shower is done with a ladle over the head. The wife of Luki, Ivon, keeps the cottages clean, presents weekly fresh bed linen and towels and cooks excellent. Lunch and dinner consist of different types of vegetables (stirr / fried), rice or pasta, tofu, eggs, fish or chicken, sometimes fresh fruit, mostly watermelon or bananas for dessert. The breakfast is lighter, fried bananas, pancakes, fruit or toast with eggs. Coffee, tea, drinking water is always available. All meals are served at specific times (7, 12, 18) so you can plan excursions, snorkelling very well. The small dive center of Luki also rented equipment for diving and snorkeling, we borrowed some parts, mostly we brought with us. His brother Alvian led us to the most beautiful dive spots where we had unforgettable experiences. We met sharks every dive, as well as huge turtles like in Galapagos, one specimen was at least 130 cm long. Then we had a long-awaited encounter, there were five mantas (up to 5 m span) the approx 50 minutes were circling above us, very curious, came over my head to a distance of less than 1 m, but thought the touch. Since the current was very strong there, we hooked on a rock 13 meters deep and filmed and photographed them for over 40 minutes. The dive lasted 61 min., the huge, wondrous creatures stayed with us for 50 min. I stayed there more than a week in December 2018. Nice location but very poor, tasteless and redundant food and a noisy generator very close to the rooms. The Bungalows are spacious but certainly there is nothing VIP about it. 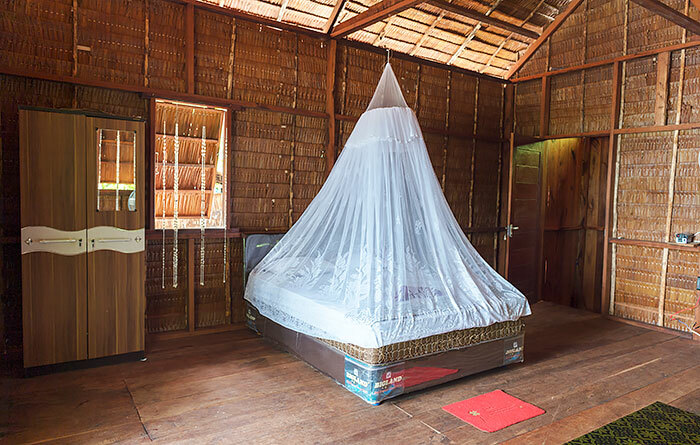 Poor light, only a broken chair made up the furniture, holes in the mosquito net. Even after one week, WE had to insist on a change of sheets and towels. I cannot recommend this place at all! For me it represents everything a R4 homestay should not be… taking advantage of the homestay monopoly and clan structured ownwrship of Kri island for charging ridiculous prices for a very very poor service. Sure one can find better ones in Kri! We made a booking for 10 nights in December which we highly regretted. The VIP bungalows are spacious, the views are great, but so many things are inacceptable and need improvement….. The bungalow was equipped with 1 broken chair, the mosquito net had several big holes, the light was not bright enough to lighten up the bungalow at night, the verandah did not have a light bulb installed, no mirror in the bathroom, not a single shelve installed to organize your stuff …..well a VIP bungalow should provide a little bit more comfort. Especially for the money asked! The noise from the generator just 10 m behind our room was really to loud to have a relaxing time in the bungalow after sunset. We were not able to sleep before it got shut off around midnight. In the last 4 days construction work for a new bungalow carried out beside our room with heavy tools like chain saws etc. and generator running all day. We were not asked once if we feel disturbed. This was not a nice experience since the owner definitely should know better. Due to his saying, he has studied tourism business in Jakarta!!! But what really disappointed and disgusted us was the food: it was the most bland and boring food we had during all our 3 visits in Raja Ampat and really got worse the last 4 days when we were the only guests at the homestay. The food was usually cold, no variety of vegetables, fruits and fish and always prepared the same way: vegetables in a watery soup, tuna in a watery soup, last 4 days instead of fish always fried eggs (cold). Honestly on the last day being served fried cold eggs for breakfast again we declined and rather went hungry. We stored some medicine in the kitchen fridge and were disgusted about the rotting smell coming out when you opened. So more than once we thought about food hygiene and clearly saw and smelled the reason for our stomach problems. Overall we definetely would not stay there again and dont recommend staying there at all. It is a pity because with some more attendance and better cooking this could be a nice homestay. Luky is always available for informations and tour . 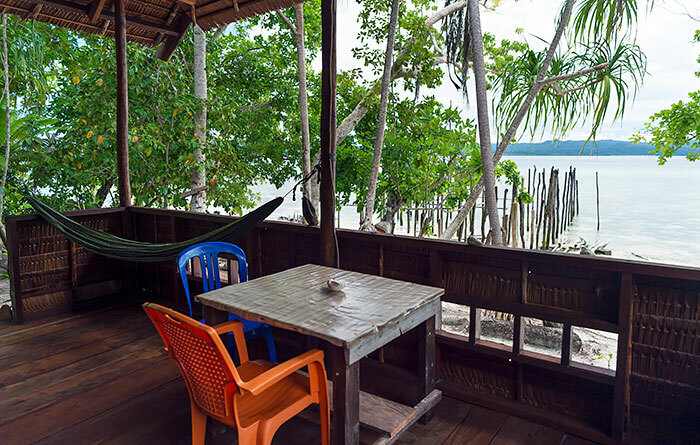 We got a confirmation for a stay of five nights, got another confirmation by Whatsapp the day before our arrival and when we arrived we learned that the owner has double-booked and tried to place us in his “old place”, the run-down Delfin homestay. Fortunately we found a better place to stay. Don’t trust Lukson confirmations! Booked it half a year ago and confirmed the booking and transfer with the owner before arrival through facebook. Nobody was waiting at the pier in Waisai and he didn’t accept any phone calls, but with the help of the friendly locals we could find somebody to bring us to the homestay. Once arrived, the owner told us that the rooms are not available because some guests decided to extend their stay the night before. So he decided to ignore our booking that we made half a year ago and that he personally confirmed to give it to some people who last minute decide to stay longer. He told us that we have to stay in his old homestay and that there are no other rooms available at any resorts at the island. The rooms were not ok, so we walked around and eventually stayed at one of the other resorts (most had rooms available, different from what he said). Definitely would not recommend to stay here – too unreliable even if you receive a direct confirmation from him. Thanks for the quick response, I sent you the booking ID via fb. We really appreciate your website by the way, it was a huge help for the entire trip and the other booking we made was perfectly fine. This place is just paradise!!! We give 5 stars to this homestay!!! We stayed in a VIP bungalow which is huge for 2 persons. 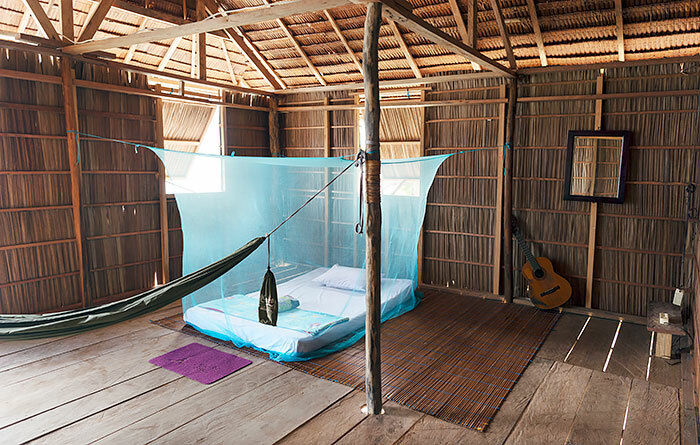 Nice bed with an mosquito nets, hamac inside the bungalow, bathroom. The bungalow is on the water so when it’s high tide you wake up with the sharks swimming around. Lucki is really nice and helpful. He speaks well English, you can ask him everything. Rummy the 3month old puppy is so cute that it was hard to leave him. The food is also tasty, we get always rice big fresh fish, lots of vegetables. 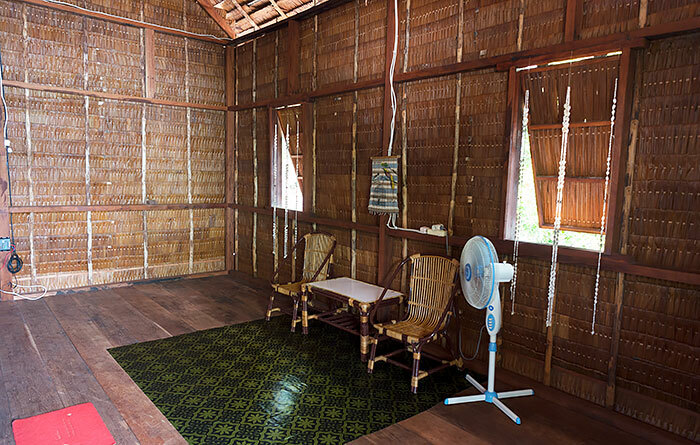 Our stay at Lukson homestay was a great experience. The location is very beautiful and peaceful. You can hear only sound of ocean and lot of birds. During the high tide you can see lbaby sharks and rays swimming in frontof the bungalowe. The snorkling is nice in front of the homestay but better more to the right. Luki and his family is very friendly and helpful. We had a great time and experience. Thank you Luki! 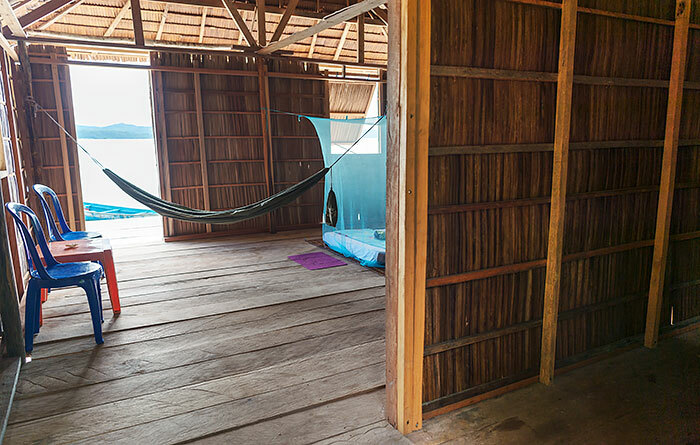 Lukson has beautiful large rooms with ensuite bathrooms – a rarity among the hometsays on Raja Ampat. The so called VVIP bungalow is beautiful with a spacious terrace and nice views. The other two are right on the water. One of them had a hammock and a mirror. The mattresses are new and good quality. 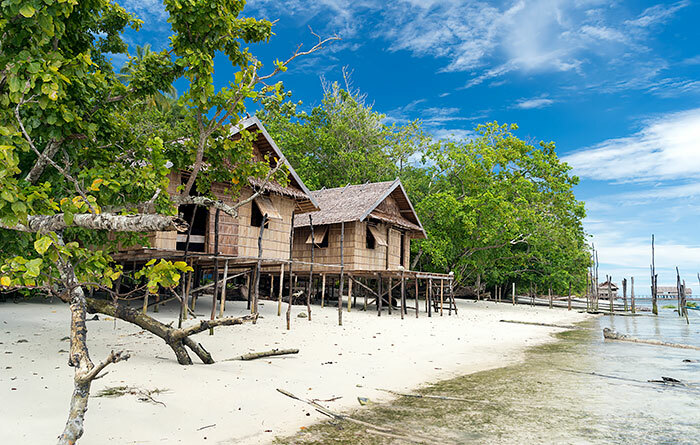 The setting of the homestay on a white sanded beach is scenic. 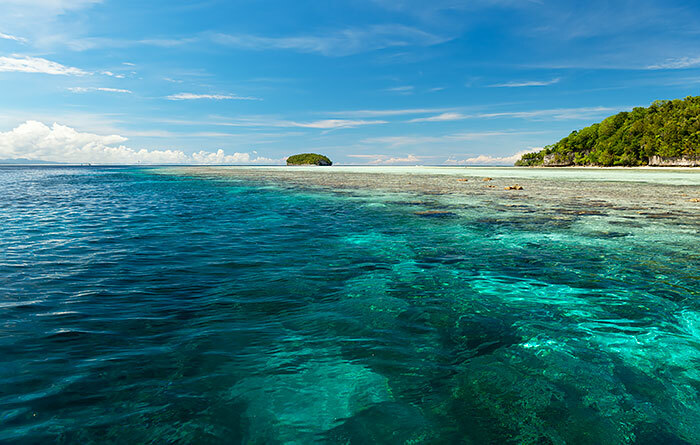 The reef in front of the bungalows is great, you just need to swim through a sea grass field which is also interesting. 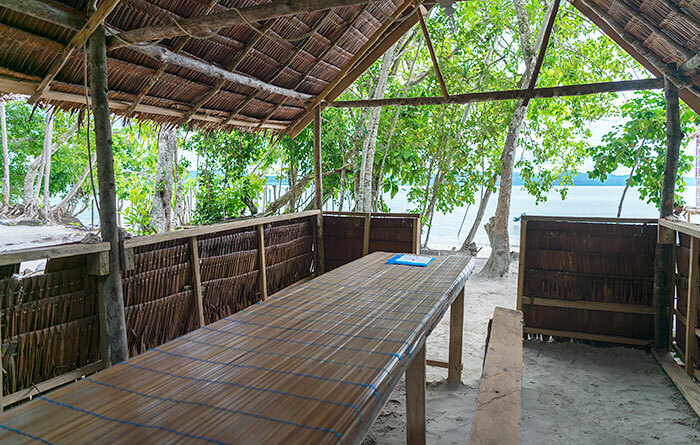 Lukson is one on a row of home stays and lies between two dive resorts. For many people it is an advantage, because you can dive while staying for cheaper. As we only snorkel, we found it a bit uncomfortable to meet a huge No Entry sign while walking on the beach at the border of the resort. You are not allowed to the neighboring jetty of the Eco Kri resort and they don’t sell you drinks even to take away in their restaurant. They also don’t rent their kayaks to you if you don’t stay there. Their choice, it was just strange to meet these rules in this beautiful nature, on a tiny island. The birdlife of Kri is amazing. We have seen a new species almost every half an hour within our three days of stay. The phone signal was scarce, we had to walk twenty minutes to the second jetty, that of Yenkoranu, which we were allowed to enter, to get signal, actually. Yenkoranu has a nice bar as well where you can sit on bean bags while observe black-tip sharks swimming by. The way back to Lukson gets funny at high tide though: At one point you need to enter the sea and walk in waist-high water if you stayed too long watching the sharks. Hi, is there any phone network available? Which one? Thank you. Yes, as mentioned in the “Details” section above, a reasonably strong phone signal is available. Full telephone and internet information is available on this page. I warmly recommend the homestay as it is some of the best bungalow with private bathroom you will find around, nice sea view and clean. Do not leave food inside as rats are an issue like in every homestay in Raja Ampat. Food was plenty with vegetables. I really appreciate the fact that the owner Lucky made his outmost efforts to enable me to remain in the homestay to run while he was actually having medical treatment in Sorong. He was helpful and in contact each day despite his condition and I wish we could have met. Some things could get improvement such as organizational mishaps (fuel shortages or the like) but it is probably due to the fact that Lucky was not there and his brother is a student and cannot fully take charge. I am sure that the next visitors will come when Lucky will be back. Same for cooking, some more variety of vegetables and fruits would have been nice to have more often (I bought some but they let them rot) as well as cleaner maintenance of the small kitchen (his sister next door does very nice cooking), so maybe they should rather merge for the kitchen. In all cases if you stay a week it is very nice, I stayed 2 so Papua food gets repetitive if you stay long. I organized my diving trips with Yenkoranu diving center most of the time and at times through the help of the nearby homestay (from the sister). Transportation costs in all Papua are expensive especially if you don’t come as a group, and it requires patience if you travel alone to find other people to join and share costs. In all cases the family and Lucky were very helpful. Pay a visit to the cockatoo Jacob also staying with the sister homestay next door and please do take it for a walk, to fly or just to pet because it is a lovely bird attached to a tree all day by the homestay owners who do not do such activities with him. Sulfur Crested cockatoo can leave 80 years and like most parrots are endangered, sadly papua families tend to take babies from the next and keep them as pets which negatively affect the rate of reproduction of the bird. So at least make his life enjoyable and yours by giving it a ride on your arm or shoulder.